Georgioupolis is a small village at the mouth of the Almiros River. 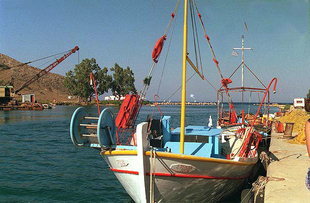 It is east of the bay of Souda before Rethimnon. During the approach, a small church on an islet east of the mouth of the river is clearly seen. The islet is connected by a causeway to the mainland. 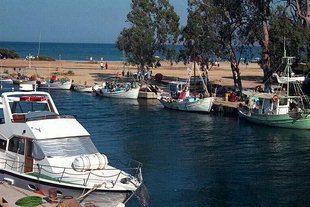 The village of Georgioupolis can provide most provisions especially during the tourist season (April - October). There will also be a station for mailing and a telephone office with international facilities. 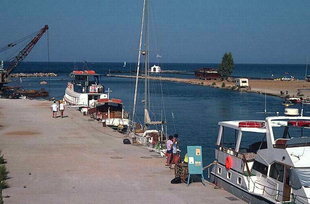 There is also a Health Centre in Vamos (10km) and a pharmacy in Georgioupolis. Full health services are in Chania 30 minutes away. Fuel can be arranged with some difficulty and no repairs can be done there. There is a shoal and underwater rocks in the bay. The quay is on the east side of the river, the deepest side. 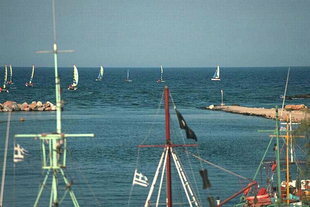 Mooring is alongside on the quay or anchorage in the small bay west of the river. Protection is good except in strong north or northwest winds. There are no lights at night.